Club Penguin Cheats by Mimo777 Club Penguin Cheats by Mimo777: Club Penguin Books, Books & More Books! Wow, Club Penguin authors have been busy! There are going to be several new books coming this year! "Shadow Guy and Gamma Gal: Heroes Unite"
"The Ultimate Official Guide to Club Penguin: Volume 2"
"Party Time, All the Time!" I am really excited about the Heroes Unite book. It is a graphic novel! Let me know which books you might be getting! Awesome! I wish I could get those books right... now! that book looks cool. I wonder if the sweatshirt will come out too. I think it looks cool because I like puffles! Sweet I cant wait till the shadow guy and gamma Girl one comes out either! MIMO777 u rock! Wow! i saw those books on amazon about 2 weeks ago maybe more! hey mimo, i've been looking through your archives and they go back to may or march 2007 right? well i remembered when my greenteddy was made and he is about 3 months older than your oldest post. i can't beleive your site is that old!!! actually, i have a little question about the cp comics book i got. 5there seems to be no code entering place for it! is this true, or is there something wrong with my account? HEEEEYYYY!! the age group is 6-8 OMG NO FAAAIIIRRR!!! hi mimo! Wondering why I cant buy the blue puffle!! I am not a member but i was and have a black, red, and green puffle! It says the anyone can buy the blue! Why does this happen? Anyone see "DJ Bumper" on Club Penguin? But that really doesn't have to do with CP, lol! But it is fair and square, so that it my new sign-out! Thanks to everyone that voted! If you see my name come up as Hnwjanuary11 in bloo letters, that doesn't mean that I have a new site! I figured out how to change my name in my Google account settings! Lol random yeah you don't care I will stop babbling and sniff some zebras. nearly all of the types of books include a code in each one, but some don't include some, for example the secret agent handbook has a code but club penguin waddle lot of laughs doesn't. So there isn't anything wrong with your account if you got a book with no code. Also on club penuin's shop it will say if it includes a code. Yep i think we all agree that mimo777 is an ultimate cp legend. if we bought the book and if cp gave us better items like special clothes it would encourage ppl to read more cp books ..... Agree? Hey mimo!! This is Spiker1007. That is so cool!! I love graphic novels!!! I agree with Shadow, that sweatshirt is cool!! There is also an update when you view the treasure books without a code. I know, I think so too! COOL!!!! these are awesome cheats !! this is awesome!!! and i love exclamation points (by the way)!!!! I Am AWESOme!!!! Me too!They look like such good books to read although I'm don't like to read that much I have noticed the clubpenguin books are really good and interesting! Hey 9china9. I haven't heard from you for a while. Anyways, do you want to hang out on club penguin sometime 9china9? See you there! Havent seen you in a while. We should have a super bowl party. How about it? Mimo is a pretty amazing dude! hey mimo! The night club is back to normal, the only thing now is that a disco ball comes down! i hope i can get all of them that would be so cool right now i olny have one clubpenguin book and its comics. Lolz! I REALLY want that book because that's my Birthday! March 4th! first you have to sign in. then, dont pick a server but instead go to the top right corner. there should be an "enter your code here!" thingy. That's strange. Very very strange....idk why. something is wrong with your account. idk why that happens. try emailing club penguin and tell them your problem. hope that helps! Me too! I really love the pick your paths because even though the book is like eighty pages, the book takes a long time to read because you have to read all the choices. I can give you a list of things to do on the computer and off. Read, make stuff, Help around the house, Chores (boring lol), hang out with friends. Lol, me too! They look awesome! Hey, Mimo this is weird but cool. If you are a member play card jitsu fire and , this is the weird thing, the first fire tile on the right will be a water battle. It almost always happens to me. No, there's not a code for that book. there is a new Banner on Club Penguin! it seems like it is a Penguin Crashing An Aqua Grapper Vehicle... what does that mean? Hey commenters, I agree that the book should come out now and I feel bad for the person who can't get a blue puffle. It is really hard for me to become a CPG mod because I have to do this without getting noticed or else I will get in trouble.The way I do it is on my iPod touch. Okay okay- 'Leaves to sniff the zebras' is good too! lol. Also, this proves that we can make polls on CPG by commenting! Keep commenting, modding and also 'poll'ing! =P lol. Sorry for answering your question late.. Now, I can see an entering place for codes. Try it again, maybe a glitch. hi there, i dont think china will be able to meet you on club penguin bevause she might be busy like the rest of the club penguin gang. Hi, The nightclub still changes colour only if you get a lot of people in there, it will go grey the nit will change colours =) hope this helped. Because NONmembers can get only 2 puffles! Now, you have more than 2 puffles, so you wont be able to adopt any puffles..
1) Nons can go any rooms except member party rooms and CJ-Fire Dojo. 2) Nons can only get 2 puffles: Blue-Blue, Blue-Red or Red-Red. Your choice. 5) Nons can attend parties. 7) Nons can play ALL mini-games except CJ-Fire. 8) Nons can add people, delete people, report people.. etc. 9) Nons can be secret agent, tour guide and Ninja. 10) Nons can do all missions. 12) Nons can play Club Penguin! lol. Yeah, I have no clue what I would do without CPG! (Mimo you rock, you inspired me and Toysgoneby to create the Random Dancing Army [RDA]! Thanks for all you do, Mimo!) And I am working on creating a "Weelky CPG Poll"! Oh, and Safa, you are one of the best Mods here, you should be a Top Mod like Saavy! How 'bout go on Club Penguin? Chobots? Planet Cazmo? Email someone if you have an email account? Call one of your friends? Smell a zebra? (<--Random!) Hmm....I am bored all the time! When I am bored, I just come here! when are u having a party in cp? I have the great puffle switch. it is at my bookfair. it isnt great. Man, I want that poster book. I only have 2. (The one from the ultimate official guide and one that came in Beckett Plushie Pals Presents: Club Penguin Issue 5.) My wall that I keep all my CP stuff on will be all cluttered (depending on how much posters there are in it). 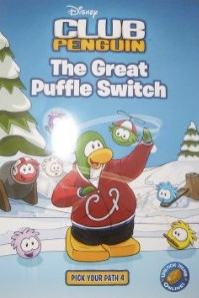 On the cover of The Great Puffle Switch book, there is no black puffle. Thanks! I really want to be one of Top Mods! And I think you should be a Mimo Mod! ;) You worked really hard and commented EVERY day! I think you should be a Top Mod! You always comment more than anyone I have ever seen on CPG! (In a row too! Wow!) You think I should be a Mimo Mod?! Thanks! I always try to comment every day, but when 2 research projects this week, one due a week from now, and one at the end of Feb., it will be hard! I can't wait 'til Mod changes! Keep working hard to get to the top! Lucky! :o I have $121 saved up from birthday $$$$$! Cha-CHING! Once I see that book, I am getting it! Ok, I was at this shopping center, on Saturday night, and I went to a shoe store and saw these really cool shoes, they were rubber and had...a zebra-stripe print! Omg! I had, like, $70 at the point, and I wanted to buy them! I almost did until I looked at the price...$119.99! If only I had the amount of money I had saved up right now...) Look at Random Comment #2 below at some point! Ok, I am in the ____th grade, and at my age, not many people have heard of CP, if not outgrew it. And I love CP! Especially Puffles! So if anyone asks what my fave animal is from now on, I will say: "Puffles!" They will be like, "Um, what the heck are puffles?" I will say "Oh, it's just, umm, and inside joke with my friends..." Lol! Here is my haiku mimo777. That haiku is about you. My penguin name is Pilot1998 k.
Plz pick me pretty pretty plz.